Intel announced its Xeon E5 is rapidly adopted by supercomputers and also revealed that the first Xeon Phi coprocessor is due this year. Xeon Phi is based on the Intel Many Integrated Core Architecture and will enter volume production by the end of the year. The Intel® Xeon® processor E5-2600 product family reached a new supercomputing milestone as the fastest adopted new processing technology to power 44 systems, including 3 Petascale-class supercomputers on the 39th edition of the Top500 list announced today. The "SuperMUC" supercomputer at LRZ in Germany, which ranked fourth on the list, delivers 2.9 PetaFLOPs of performance, making it the most powerful in Europe, as well as the largest installation based on the new Intel Xeon processors E5 family. At the International Supercomputing Conference, Intel Corporation also announced that Intel® Xeon® Phi™ is the new brand name for all future Intel® Many Integrated Core Architecture (Intel MIC architecture) based products. Available by the end of 2012, the first generation of Intel Xeon Phi product family (coprocessors codenamed "Knights Corner") will complement the existing Intel Xeon processor E5-2600/4600 product families and deliver new levels of performance for highly parallel workloads. While the first generation primarily targets high performance computing (HPC), future generations of Intel Xeon Phi products will also address enterprise datacenters and workstations. "The Intel Xeon processor E5 family is powering exponential performance gains in high performance computing and we're proud that it is having such a profound impact on the industry as demonstrated by its presence inside 45 of the Top500 supercomputers," said Raj Hazra, Intel Corporation VP and general manager of the Technical Computing at Data Center and Connected Systems Group. "As we add Intel Xeon Phi products to our portfolio, scientists, engineers and IT professionals will experience breakthrough levels of performance to effectively address challenges ranging from climate change to risk management. This is the next step of Intel's commitment to achieve exascale-level computation by 2018, and create a unique technology category that delivers unprecedented performance for today's highly parallel applications." Intel disclosed new technical details of the first commercially available product from its Intel Xeon Phi product family, a coprocessor codenamed "Knights Corner." In addition to delivering breakthrough performance for highly parallel applications, Intel Xeon Phi coprocessor's ease of use is bolstered by the benefits of familiar programming models, techniques and developer tools available with Intel architecture. With greater use of parallel CPU code, software companies and IT departments do not have to retrain developers on proprietary programming models associated with accelerators. 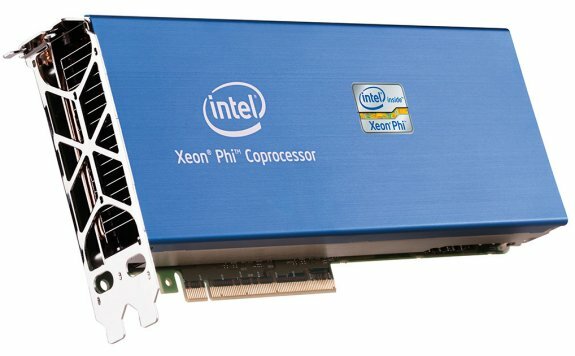 Beyond its compatibility with x86 programming models, the Intel Xeon Phi coprocessor will be visible to applications as an HPC-optimized, highly-parallel, separate compute node that runs its own Linux-based operating system independent of the host OS. This feature allows more flexibility when implementing cluster solutions that are not available with alternative graphics accelerator-based technologies. Made with Intel's innovative 22nm, 3-D tri-gate transistors, the Intel Xeon Phi coprocessor, available in a PCIe form factor, contains more than 50 cores and a minimum of 8GB of GDDR5 memory. It also features 512b wide SIMD support that improves performance by enabling multiple data elements to be processed with a single instruction. Last year Intel showed a live demonstration of the single Knights Corner coprocessor delivering over 1 TeraFLOPs (1 trillion floating point operations per second) of double precision real life performance, as measured by DGEMM. At ISC'12 Intel demonstrated the same effective performance of more than 1 TeraFLOPs per node but measured by the industry standard benchmark Linpack (Rmax)1. By comparison, in 1997, it took more than 9000 Intel® Pentium® processors inside the ASCII RED* supercomputer to break the 1 TeraFLOPs barrier. While initial production product shipments are planned for the second half of 2012, Intel has announced that the first Intel Xeon Phi coprocessor-based development cluster is up and running and ranked 150th on the Top500 list, delivering 118 TFLOPs of performance. The Intel Xeon Phi coprocessor has strong industry support, with 44 manufacturers including Bull, Cray, Dell, HP, IBM, Inspur, SGI and NEC committed to including it in their system roadmaps. "We are very excited to announce that our next-generation supercomputer code-named 'Cascade' will be available with the Intel Xeon Phi coprocessors, giving Cray customers the ability to push the limits of research and discovery," said Peg Williams, Cray's senior vice president of high performance computing systems. "Our Cascade system will feature some of the most advanced and highly innovative HPC technologies ever put into a Cray supercomputer. Combining these features with industry-leading Intel Xeon processors and the new Intel Xeon Phi coprocessors will result in a very compelling system for HPC centers around the world." Due to power-on in early 2013, the first Petascale class supercomputer powered by a combination of the Intel Xeon processor E5 family and Intel Xeon Phi coprocessors will be "Stampede." Intel expects a growing number of Petascale-class machines in the next year that take advantage of the Intel Xeon Phi coprocessors' programmability and performance efficiency. Providing a two week weather forecast with the same level of accuracy as in a 48-hour forecast, or mapping the human genome within 12 hours at less than $1000 as compared to the current two weeks at $60,000, are two examples of the many challenges that HPC will address with more compute capacity. The insatiable need for performance has driven the tremendous growth of HPC processor shipments over the last five years, and Intel predicts this growth will reach more than 20 percent CAGR in the next 5 years. Intel forecasts2 that the most powerful supercomputer in 2013 will feature the amount of CPUs greater than 1 percent of its own server CPU shipments in 2011. Reaching Exascale levels of performance requires innovation across the architecture and fabric within HPC. To deliver on its promise to reach Exascale performance by 2018, Intel made significant investments in areas that will accelerate its capabilities to deliver this performance in the future. The recent acquisition of Infiniband and interconnect assets from QLogic and Cray present key areas for Intel to innovate as the company eliminates the bottlenecks in delivering scalable Exascale-class platforms in the future. More than 74 percent (372 systems) of the supercomputers on the 39th edition of the Top500 list are powered by Intel processors. Of those systems making their first appearance on the list, Intel-powered systems account for more than 77 percent. The complete report is available at www.top500.org.